Looking for Inmotion Hosting promo codes and coupons? #MasterTheWeb and save money today with our exclusive The Webmaster offers. This is our Standard Discount which gives up to 50% off per month their Business hosting. Depending on the plan chosen you can get anywhere between up to 42% off VPS hosting. Try it out for just $14.99! This is our Standard Coupon which gives up to 50% monthly plans, 10% off 6-month plans, or 20% off 12-month plans. The coupon is activated by clicking the required discount code above. It will take you to their website, and you will see the discounted prices immediately. You will see a green banner on their website stating “Up to 50 percent OFF Business Hosting plans for The Webmaster visitors” or something similar depending on which coupon you select. This tutorial shows how to sign up for shared hosting with our Promo code. Clicking the relevant plan will take you to a further page where you can confirm your choice, and choose a billing period. There are further discounts available for signing up for 2 years, so we would definitely recommend doing this if you feel comfortable with signing up for a longer period. 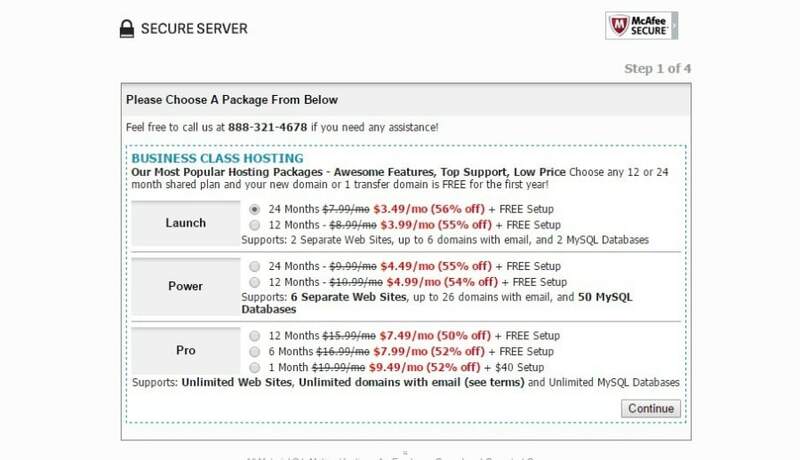 Choose your hosting plan © The Webmaster. The next stage is to enter your domain information. The domain is free, so you may wish to take them up on their offer to get a new domain. If you already have your domain simply select that option. You should have in mind that even though the domain is free, if you do decide to take advantage of the money back guarantee the cost of the domain will be deducted from any moneys refunded. Enter your domain information © The Webmaster. InMotion Hosting will then suggest an upgrade. Just ignore this (unless you want to upgrade of course) and select continue once you have checked the details of your order. Confirm your selection © The Webmaster. Arrange payment for your services. In our experience you will get an immediate email confirming the purchase, and almost immediately you will receive details of your hosting account. Their support is quite helpful, so if you have any problems in need further advice before purchasing just open a live chat and they will be more than happy to assist. You will see that the discount has been applied, and you will also get to choose your Max Speed Zone \ Location. Continue to Checkout. © The Webmaster. InMotion Hosting offers three different plans. The main difference between the plans is related to the number of websites you can host. The Launch Plan is suitable for two websites; the Power plan offers six websites, and the Pro Plan provides unlimited websites. All plans offer unlimited disk space and bandwidth, although you should check their terms and conditions for any restrictions. It is usual for file storage and files unrelated to your website to be prohibited. If you need a little more power, then you may wish to consider their VPS plans. Their base plan offers 1.5GB Ram boostable to 4GB during busy periods and 60GB SSD space for just $29.99 per month with our Inmotion Hosting Coupon. If you decide this company is not suitable for you, you may want to check out SiteGround. You can pay monthly, but only with their Pro plan. Paying monthly is not the cheapest way to buy hosting as any deals will only apply to the first month. Also, InMotion Hosting charges a $40 setup fee when you pay monthly. What other billing cycles does InMotion Hosting offer? They offer 12-monthly and 24-monthly billing cycles on the Launch Plan, and monthly, 6-monthly and yearly on the Pro Plan. It is significantly better value to sign up for two years. No, InMotion Hosting do not offer a free domain with their hosting plans. During the order process, the only methods of payment specified are Visa, MasterCard, Discover, American Express, purchase order or check. Does InMotion Hosting accept PayPal? There is no option to pay via PayPal on the order form. However, you can pay by PayPal if your order is not with the monthly payment option and the order is over $50. If you wish to do this, just simply open a live chat or ticket, and they will process the order for you. Does InMotion Hosting accept Bitcoin? InMotion Hosting offers a 90-day money-back guarantee. The guarantee does not apply to addons such as domain names or SSL certificates. The money back guarantee only applies to new accounts, not renewals. Yes. The discount offered by our deal only applies to the initial invoice. We recommend signing up for two years to make the most of it. Will InMotion Hosting transfer my website for me? Yes. They will transfer up to 3 items for you free of charge. An item can be either your entire cPanel account (which includes the website, emails) or if no cPanel is currently used then an item may be a database or the website files. If you have more than this, you can pay $10 for each additional item transferred. Does InMotion Hosting take backups of my website? Yes, automated backups are taken of your website, but there are a few things you should know. Firstly, backups will only be made for websites less than 10GB in size. Secondly, you are limited to restoring your account once every four months free of charge. Further restores are subject to a fee of $49. We always recommend taking your own backups.